I am completely blown away by the support we got from everyone for our #Kickstarter Campaign. Kids, parents, teachers, business owners — so many awesome people have supported me, encouraged me and told their friends about ADHDKidsRock.com. So — THANK YOU ALL! What’s Next? What does this money mean for ADHDKidsRock? Here’s the plan for the #Kickstarter money — and lots of ways you can help make this happen. 1- We’re going to help teach teachers about #ADHD. This is huge. 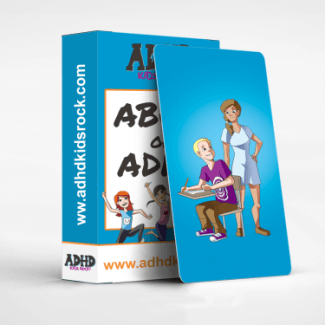 This money means I’m going to make the “ABCs of ADHD” flashcards for teachers — and donate them to schools as well as sell them to reach as many teachers as possible. All the great ideas we’ve heard from teachers in the ADHDKidsRock.com community, as well as the best ideas from experts I’ve personally met, and the ideas I wish my own teachers had used with me — they’re all going onto flashcards to make it easy for teachers to learn to help kids with ADHD. You can help! If you’ve got a great tip for teachers, leave it in the comments on this blog post & we’ll include as many great ideas as we can. 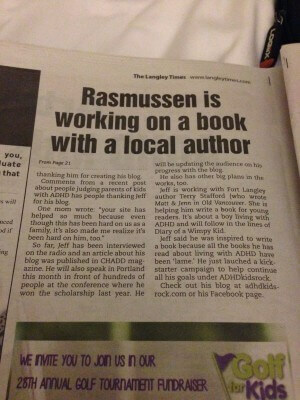 2- I’m writing a book for kids who have ADHD, where they are the heroes in the story. I was never the hero in the story when I was growing up. I was bullied a lot and I lost a lot of friends. ADHD is really hard on kids and it’s easy to feel like you’re all alone in the world when you’re being bullied for being different. Other kids with ADHD clearly go through the same kinds of struggles that I went through as a kid. Well, now we have the money to finish writing and publishing the book for kids with ADHD — where the kids with ADHD are the good guys. I won’t say too much, but I hope you’ll check it out and share it with kids who have ADHD when it’s ready. 3- Reach more kids with ADHD for the Blog. I am also adding a Resource Page to my site this month with helpful links to ADHD organizations, ADHD coaches and support groups. If you have used an ADHD coach, organization, book or support group that you would recommend 100%, please share it in the comments section of this blog post & we will see if we can add it to the Resources Page. I have other website improvements that I’m hoping to do, too. I’d really like to find a creative & reasonably-priced game developer who could create some cool games for kids at ADHDKidsRock.com — if anyone knows of one, feel free to email me the details: jeff@adhdkidsrock.com. So, THANK YOU all for contributing to Kickstarter as well as sharing it so much with your friends and family! We have lots of work to do now, and I hope we’ll get lots of people helping and sharing! I even got a message and support from the Mayor! Thanks for reading. It means a lot. Hope to hear from you in the comments — and maybe you can share this with a kid who has ADHD?